The biggest joy of every married couple comes in the form of their baby but sometimes infertility gives a hard blow on their happiness. 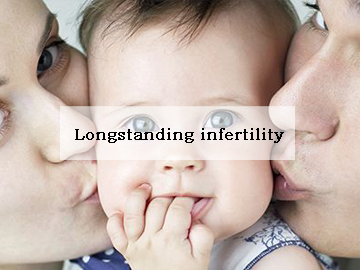 Infertility comes with a lot of emotional stress for the couple. We at Gaudium IVF, the best IVF centre in Delhi believe that not only should the infertility be treated but the couple should first be made emotionally stable and should have the right support throughout their treatment to ensure successful results. Here we have a success story of a couple wherein the woman of 27 years of age reported us with a history of longstanding infertility. She and her husband were emotionally shattered as they were trying and failing for 14 long years. The case was immediately transferred to the counsellor to help them get rid of the emotional stress. Not only were they suffering from a lot of stress but the woman was also suffering from Diabetes and Hypothyroidism as diagnosed by our expert doctors at Gaudium. They also have had multiple IUI* failure in the past. The couple was counselled by the counsellor and were made emotionally ready and positive before the treatment. The procedure ICSI (Intracytoplasmic sperm injection) was performed on the patient. In the process of ICSI, the sperm and egg are retrieved from the male and female body respectively. The sperm is then directly and carefully injected into the egg. The egg is then transferred back to the uterus for growth. The procedure followed by the team was apt according to the medical condition of the patient and she conceived successfully. She gave birth to healthy and beautiful twins. The happy couple could not thank enough to the team of Gaudium since they had been longing for a baby since 14 years. They said they had lost all hopes but after coming to Gaudium and meeting the counsellor and the doctors, they had their hopes ignited again. We truly believe giving hopes to such patients and work towards achieving successful results and creating such happy stories that could inspire more such couples. Infertility is nothing to be ashamed of nor is it untreatable, with expert guidance and supervision anyone can become pregnant. 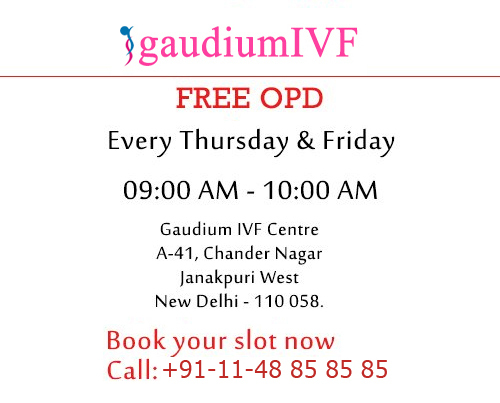 We would like to invite you for a free consultation at Gaudium IVF, a trusted name for infertility treatment in Delhi. * IUI (Intrauterine Insemination) is an artificial reproductive technique in which sperm is placed inside the women’s uterus for fertilisation to take place.